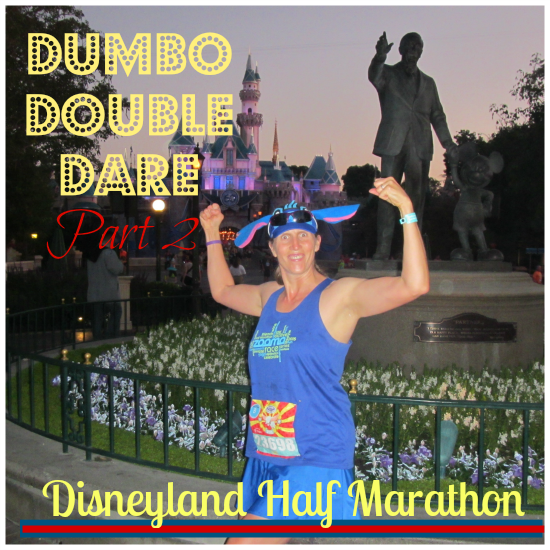 We are never ones to pass up a good Disney race recap so when our friend Lois agreed to share her experience at the Dumbo Double Dare race challenge over Labor Day we were excited! After visiting Disneyland for one race challenge this year, I'm not sure when (or if) we will fly cross country to do another one, but it sure was fun seeing it through Lois's perspective! Sunday, September 6, 2015 was the last day of racing at Disneyland. It was the final leg in a long journey. It was a day when dreams came true. It was the day that I would accomplish something I had set out to do almost 2 full years earlier. 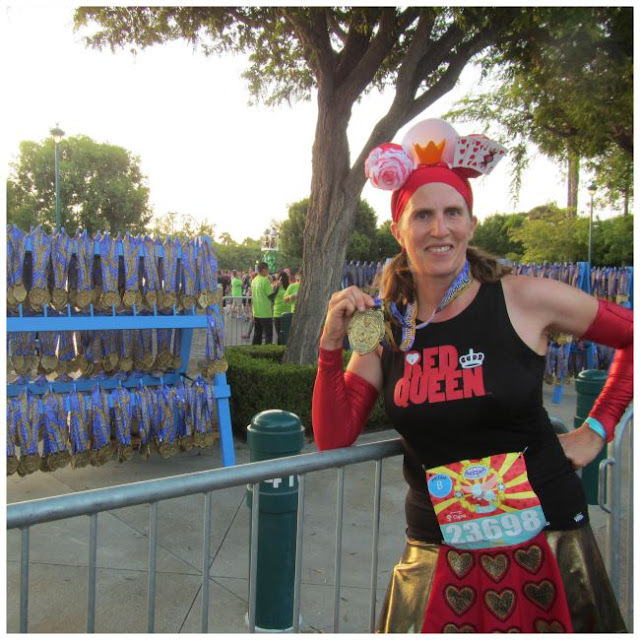 It was a day I would do the Disneyland half marathon, a day that would finish up the Dumbo Double Dare Challenge, and a day that I would get the coast to coast medal. Like in Dopey, the multiple mornings with the O dark thirty wake-up call seemed like they were getting earlier. And like Dopey, the day of the longest race of the challenge I was able to get out of bed quickly and move quickly. Unlike Dopey, I didn’t get stuck in a major traffic jam as I headed to the race. 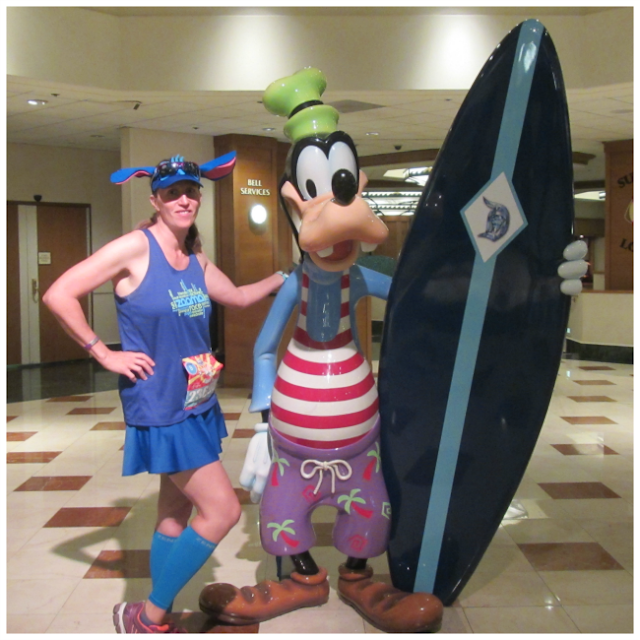 By this time, the Goofy statue and I were getting very well acquainted, as I stopped there for yet another pre-race picture. I met up with my friend Erin as we were coming out of the elevators, so we walked over to Downtown Disney together. We met up with some friends for a pre-race picture and some words of encouragement. We met at Earl of Sandwich, which was a great place to meet. It was on the way to the start line, but it wasn’t crowded so we were easily able to find each other. 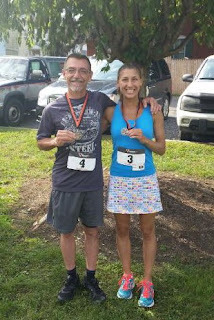 My friend Melanie and I had hoped to run the half together, so I was very thankful for an easy spot to find each other. We headed to the start line. I dropped back a corral so we could start together, but we made our way to as near the front as possible. We actually were right by the 2:30 pace group. We thought about trying to stay with them, but we also know pace groups don’t stop for anything. 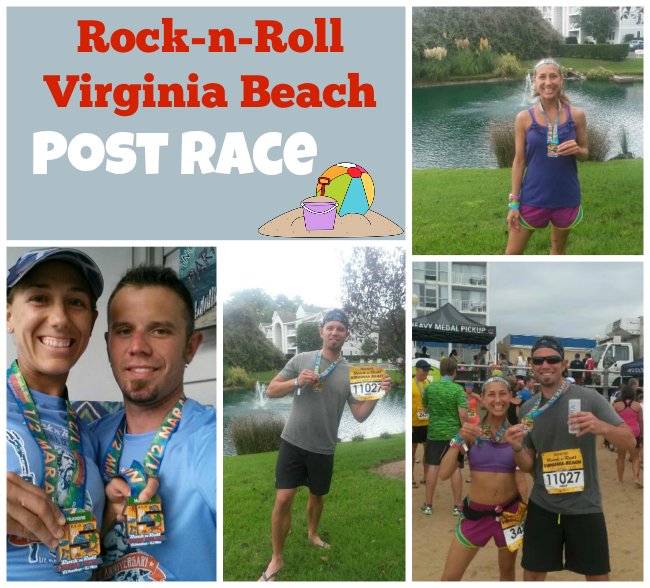 We decided to run our own race and pace and not join the pace group. We didn’t stop for many pictures while in Disney’s California Adventure or Disneyland, the lines were just too long, maybe due to the fact that the hero of the story was combined with the villain. We saw Lady Tremaine with Cinderella, the Evil Queen with Snow White. We did stop for DJ and Lightning McQueen and we absolutely had to stop for Tiana and Dr. Facilier since that is my youngest daughter’s favorite movie! I think every race for the weekend I made a stop in Cars Land for a picture of whatever Cars character was out. We stopped by the Mickey wheel and by the castle for some pictures, then we headed out of Disneyland and we hit the streets of Anaheim. I have to tell you, I had heard about the entertainment on the streets, but I didn’t think it was going to be as much as it was. It really was a street party. I loved the dancers, the high school bands. The costumes of the Spanish dancers were so bright and beautiful!! I forgot to get a picture of them, but I loved the hula dancers that I did manage to get a picture of. The classic cars were amazing. I thought it would be a small group like in the Speedway of the marathon. Goodness, no, the cars went on for over a mile. My favorite color is purple, so when I saw an awesome purple car with Elvis Stitch on the front I had to get a picture. I was Elvis Stitch for the full marathon for Dopey, and Stitch for the half for Dumbo, so it was the perfect car to just snap a picture with. Angels’ stadium was probably one of my favorite parts of the half marathon. I grew up a HUGE Cubs fan, and I had once dreamed about seeing a baseball game in every major league stadium. So when we hit Angels’ stadium I was so excited. I love running the warning track on a baseball diamond. I do the Coors Field Homerun for the Homeless just to run on the warning track (and get a slushie for free). When I was doing Dopey, I didn’t hate ESPN zone, because we got to run on a baseball field. So to run on the warning track at Angels’ stadium just got me pumped up. I told Melanie that we should run the entire thing, no walk intervals…but then we had to stop for a picture. I loved the boy and girl scouts lining the stands and cheering us on. I high fived lots of girl scouts that day. Angels’ stadium was just a fun experience, and I would do the Dumbo challenge or the Disneyland half again just to run the stadium. The last few miles of the race went as expected, and I kicked it up a notch near the end. I have a habit of doing this when I run, pushing harder toward the end, so I can finish. Melanie on the other hand doesn’t like to kick it up at the end, so I did end up having to pull back a little. We passed the 2:45 pace group somewhere around mile 11 (how they got ahead of us, I have no idea). We wondered if we would catch up with the 2:30 pace group that we had started with. We didn’t catch them, but we had a great finish time of 2:33. Not bad for stopping for pictures while in DCA and DL, stopping for every mile marker, and stopping for a few pictures along the half marathon course. We were quite pleased with our time. 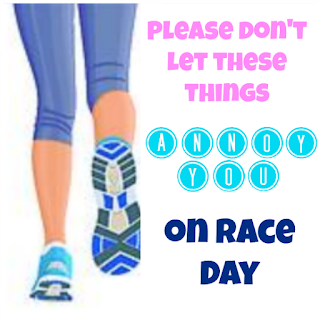 My friend Kristy recently wrote a post about things runners do that could be contributing to an unpleasant race experience for other runners titled "How to make sure you don't ruin a race for others". She interviewed a group of runners on Facebook and recorded their responses. While I was reading this post, it reminded me of a post I had been wanting to write for over a year. 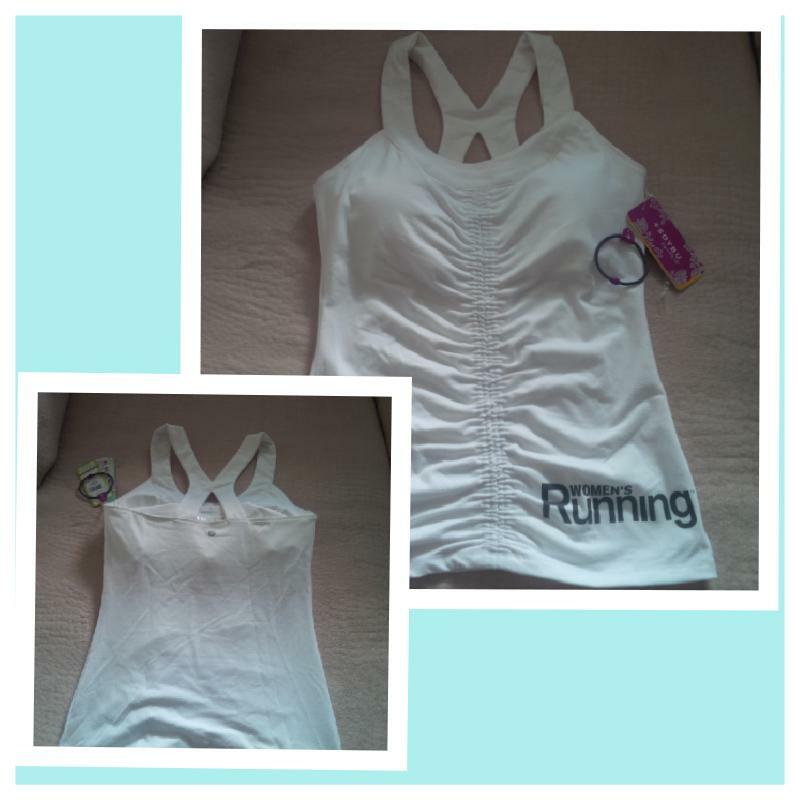 I have definitely been a runner who has had her ups and downs. 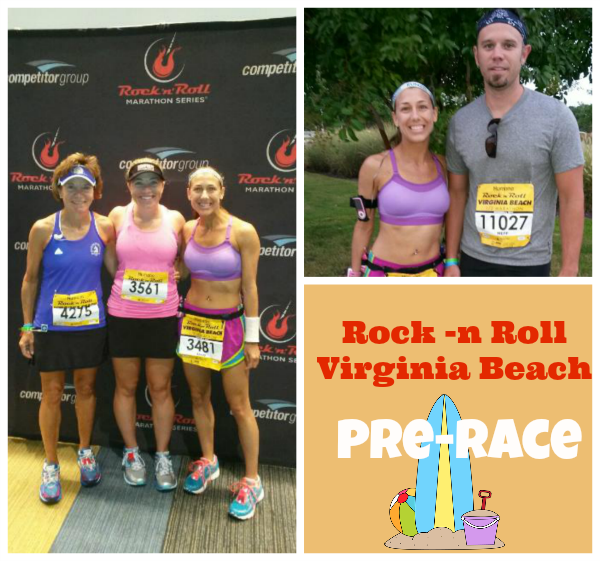 Over the years I've been a corral "A" runner, I've been a middle of the pack runner, and I've been an injured runner. For those reasons I feel I can be very diplomatic when writing this post. other runners who blow "snot rockets", run in groups that block half the road, or who just disregard runner etiquette altogether. 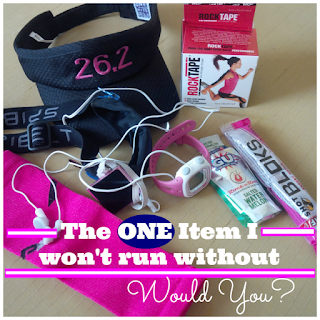 However, there are a few things that I think other runners need to just get over. 1. Yes, I know that some runners are annoyed with the run/walk runners. I have done the run/walk method in the past and I will continue to use it during my next marathon. If I am doing a race where I plan to run/walk, I know enough to place myself on the side of the road. When I am slowing down to a walk, I know to put my hand up to signal the change in my speed. That is the right thing to do. It was mentioned by a non run/walk runner that us run/walk runners should turn around and check to see if anyone is behind us before we start walking. Well, I've learned early on not to turn around while I run. When I first started running races I use to look over my shoulder to see how many people were still running behind me (I was paranoid that I would finish last). I need to stay focused on the road ahead of me, not constantly taking time to look back. I would never expect a runner in front of me to look back. That's what the hand raise is for. When you are driving a car, you are responsible for controlling your vehicle so it does not hit the car in front of you. I feel the same thing goes for running. I am responsible for paying attention to what is in front of me. Perhaps not every runner is familiar with the run/walk method and might not know what the hand raise signifies. Well, runner's are a smart bunch, I think after a while they'll figure it out. 2. Apparently the constant beeping of Garmins and other devices us run/walkers use annoys other runners. Honestly, I was shocked when I heard this one. This is so insignificant that I can't believe any runner would actually say this. If these runners don't need the beeping for running intervals then heck, they shouldn't even be running at my pace. They should be ahead of me. Or better yet perhaps these runners should just put their ear buds in and listen to their music. was but that is just all part of the experience. Not everyone who is in your same corral is going to run at exactly the same pace at the same time. You need to be prepared to share the road with everyone. (yes I'm talking about Lacey), then perhaps those runners should just run by themselves at home on their favorite trail. 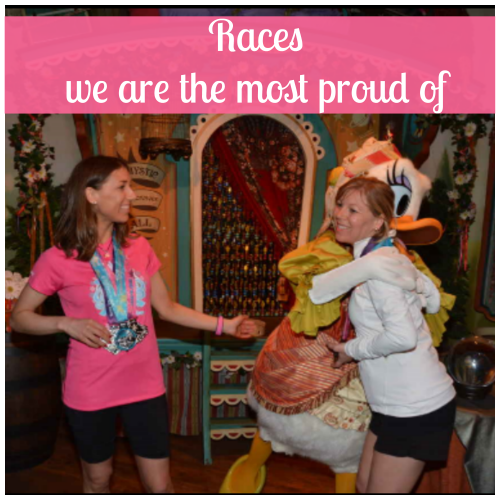 You will no doubt experience all sorts of runners on race day. Some will not run the same way you do, but keep in mind that everyone's goal is to cross that finish line and they are doing whatever they can to make it possible for them to do that even if it means doing a run/walk and having their Garmin beep. that I was going to write a follow up post to hers. 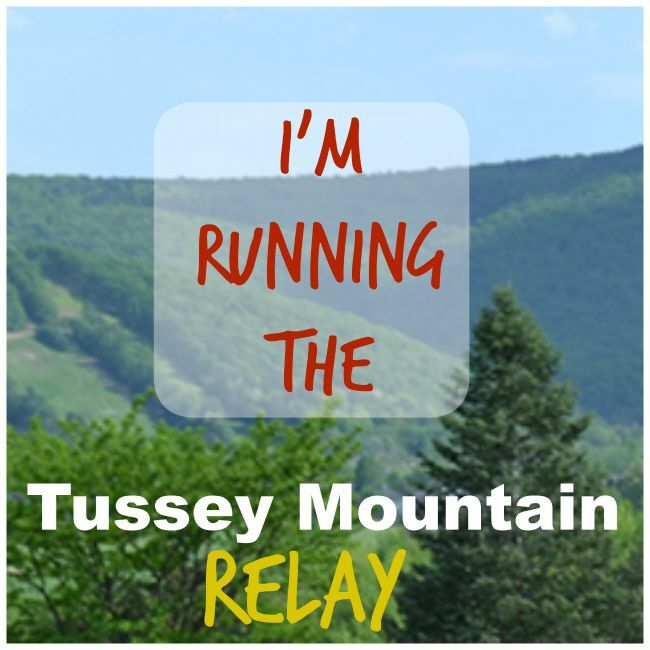 There are so many things that I am looking forward to this fall but the one thing I am especially looking forward to is participating in the Tussey Mountain 50 miler Relay Race in October. 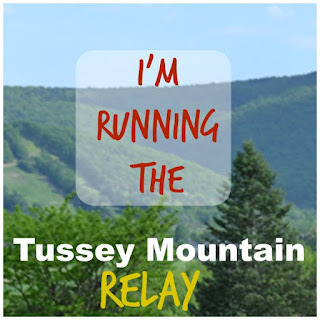 Several years ago I ran this race with members and instructors of the gym when I worked there and we had so much fun. This summer when I started teaching classes at the gym again I had the opportunity to become part of the team. Of course I accepted. There are so many great things about this race. Their motto is "Just for the hill of it"
1. The terrain. Yes it is very challenging as it is straight up the mountain with much elevation, but it is mostly on a dirt road which is much easier on your legs than a road race. What goes up must come down, so the second half of the race isn't as bad as the first half. 2.The weather is usually perfect during this time of year for the race. The trail is mostly shaded so you do not get the direct sun on you. 3.I have always wanted to do a Ragnar Race, but this ultra is great since it is only one day and there is no restless sleeping in a van. 4. One of the things I like about being part of an Ultra is the aid stations. So much better than at a marathon. In addition to water and Gatorade, they have snacks such as gummy bears, swedish fish, pretzels, and even peanut butter and jelly sandwiches. Some of the aid stations are only for the Ultra runners (that are doing all 50 miles by themselves). 5. Finally, it is just fun. There is 7 of us that do about 2 legs each. We get shirts made that say, "We run for Fun" because that is why we do it. There is no pressure with this race..
Over Labor day weekend many people were preparing barbeques, hitting the pool for a last dip before summer ends, or just enjoying a lazy weekend. That weekend was anything but lazy for our friend Lois. She was starting the second of three races out at Disneyland. 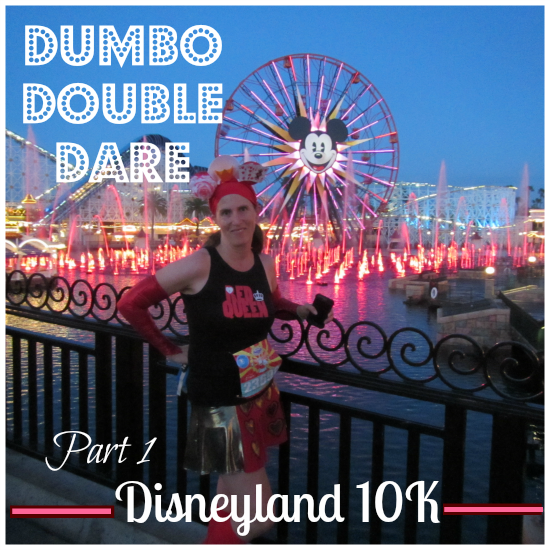 She participated in her first Dumbo Double Dare and she is happily going to tell you all about it starting with the 10K on Saturday. 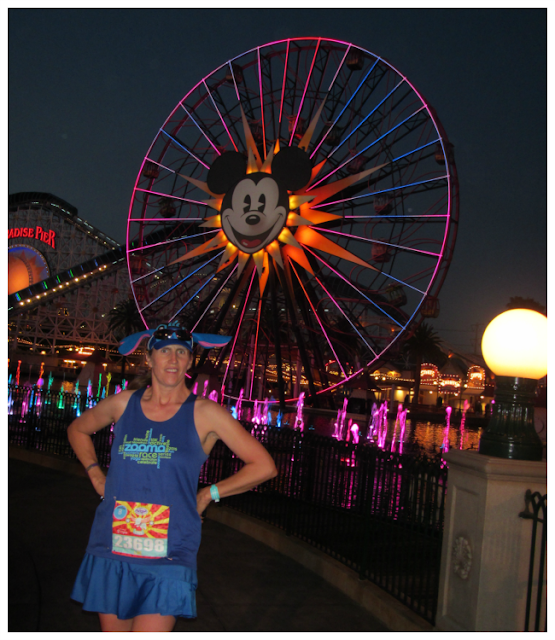 Being on the west coast made the early morning wakeup calls much easier than the wakeup calls at Walt Disney World for the Dopey challenge. The 10K was villains themed, so I dressed as the Queen of Hearts and headed off to the races. 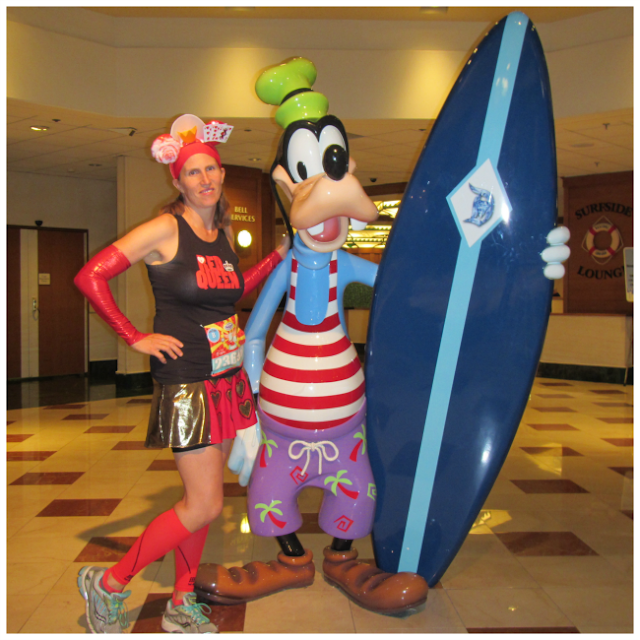 The Goofy statue in the lobby was my go-to for the early morning prerace picture, just a fun place to take a picture. The walk to the start line was an easy walk and didn’t take long at all. I loved that part of the Disneyland races, they were all so easy to get to, no getting up extra early to catch a bus or leave early to beat the race traffic. I absolutely loved being able to walk to the start line, and then at the finish of the race, walk back. Disneyland can’t be beat for the ease of getting around race morning. The race didn’t put us right into the parks, instead we headed down Disney Way toward the convention center, circled around that, and then entered the park on the east side on Harbor Blvd. I liked being on the street for a bit, as it gave the corrals time to thin a little. 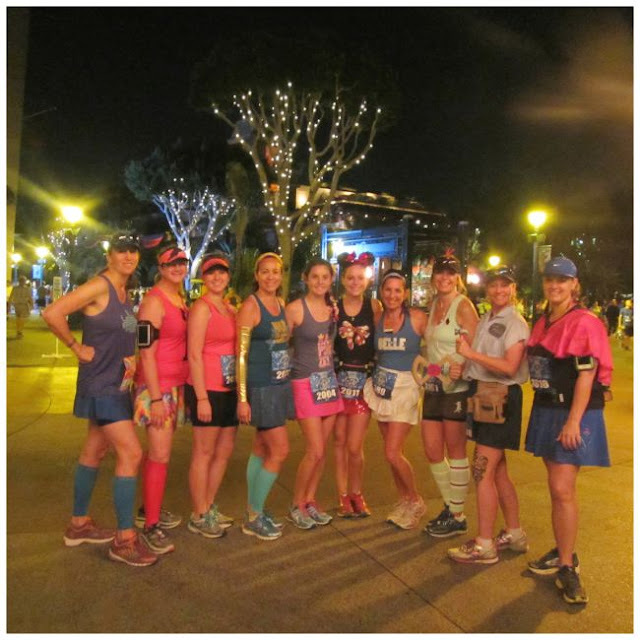 Once we hit the parks, we didn’t leave until the very end of the race where we went through downtown Disney to hit the finish line. 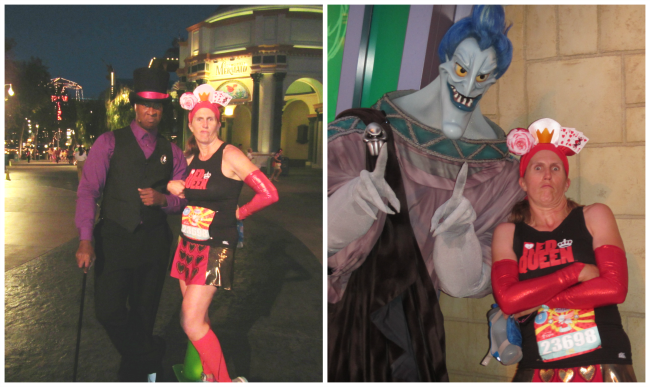 Along the course, the villains were out. I stopped to get a picture with DJ, and who I thought was the shadow man from the Princess and the Frog (my youngest daughter’s favorite movie). They had Lotso out from Toy Story, but the line was super long and I didn’t want to wait. As we rounded into the Hollywood Area, Hades was out. I’d never seen him, so I stopped for his picture. Man, he is one scary dude. Then Lady Tremaine was right there, so I stopped there as well. We crossed over from Disney’s California Adventure into Disneyland. The one big difference between the west coast and east coast Magic Kingdom’s is that the castle on the west coast isn’t a prominent feature. I of course stopped to get a picture by the castle, but it was rather underwhelming, after doing the races at Walt Disney World. I loved going behind the scenes and seeing the train depot, the floats, and the Imagineering building. I don’t know why, but seeing that gave me the chills, I guess it comes from knowing that is where the magic starts. 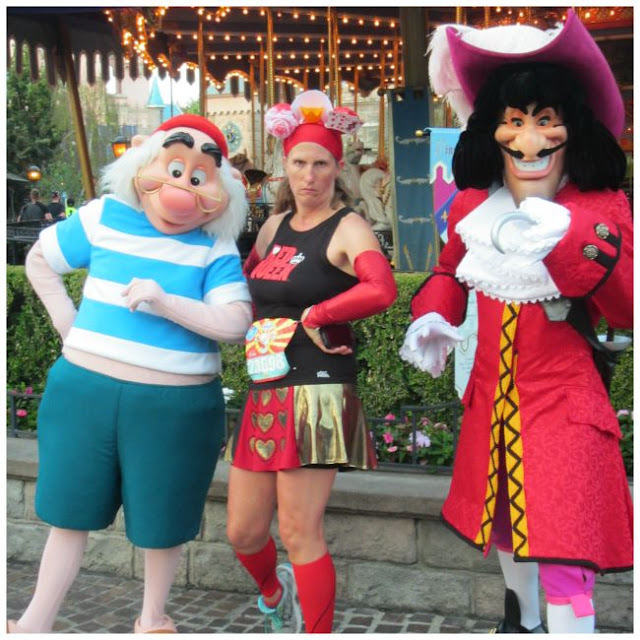 I didn’t stop for many pictures in the Magic Kingdom, but I had to stop for Hook and Smee (maybe it is because I absolutely adore Killian Jones on Once Upon a Time, so I just had to get a picture with the original). The 10K ended the same was as the 5K, heading out into Downtown Disney, then through the finish line near the Disneyland hotel. It was so much fun to see all the villains out, and as I was crossing the finish line Malificent was there. Once again, the 10K didn’t disappoint, and I really think it is my favorite distance. 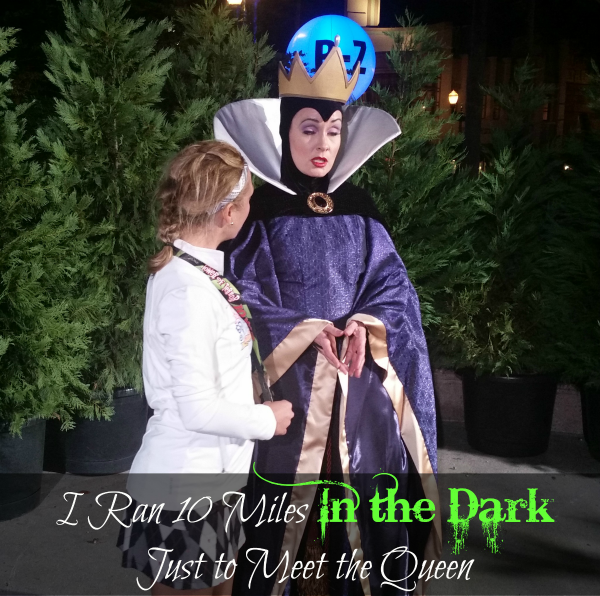 Have you ever done any of the Disney 10K's? What were your thoughts? Every year our local area puts on a 5k race in celebration of the Harvest Festival. None of my family ran it last year, but my dad and sister ran it in 2013 and I ran it in 2012 and then another time a few years back. The last time I ran it I placed first in my age group. I run a lot more now than I did back then so I was hoping to place again! We had a beautiful day for the race. The best I can remember in recent years. The race did not start till 9:30 am and it was already starting to get hot. This was a chip timed race, however there was not a timing mat to step on as you started the race, there was only the finish line timing mat. So I guess those that started near the back had the same start time as those in the front. That isn't really fair but I guess since it is only a 5K it's not like anyone needed this as an official time to qualify for another race! Right from the start, I felt short of breath and just didn't feel right. Knowing that I won first in my age group before, I wanted to meet my goal again. Since it was a local race, I knew a lot of people there and I felt that added pressure to make sure I did well. The first mile I didn't feel like I was going that fast since my breathing was off. I looked at my Garmin and it read 6:47. What??? I have to slow down. No wonder I didn't feel right. I knew I had to hold my pace back the following miles. When I did that, I started to feel a little better. Even though I finished strong, I wasn't feeling very confident with my time this year, like I had in the past. 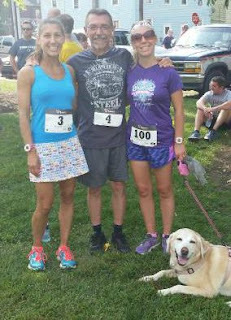 I met my mom, Scott, and Baylee at the finish line and waited for my sister and dad to cross. After they crossed we had to walk across a parking lot back to the lawn of the registration building to get water and snacks. It wasn't a far walk, but it would have been nice to have the water given out somewhere right past the finish line, especially since it was such a hot day. The race was pretty organized and right away they had our names, times, and places up on a board to view. I saw that I placed 2nd in my age group, which I was still happy with. My dad said that he placed 4th, and of course awards were only for the first three in each age group. We stayed for the awards ceremony and we were surprised as well as my dad was to hear his name being called for 3rd place. Silly guy can't read the results right. He says, "well I'm glad I stuck around." I was also fortunate enough to win one of the door prizes, free admission to one of the corn mazes! Later that afternoon I went back downtown to visit friends and watch the annual parade. What a beautiful weekend. Next up, is a 5k through the Vineyards next weekend. I will be looking forward to that. As most of you know, I've been pretty dedicated to going to the gym at my PT office. And you may also remember me saying how I am one of the younger patients there. 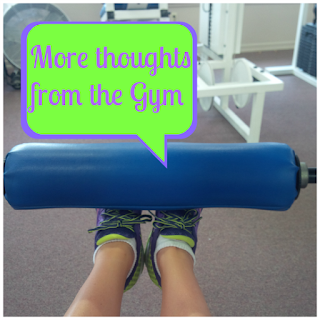 Since I've been going there for a while now, I wanted to continue to share with you some more of my thoughts about the gym (and the people there). here for months and never got a blue chart. Perhaps they think I am young enough to remember what I am suppose to do? 2. I totally understand why people grunt while lifting weights. I try really hard not too. Sometimes I hold my breath so I don't make an unnecessary noise! sit there and eat snacks. I saw a box of donuts sitting there the other day. One lady even sits and does her check book. 4. Speaking of the older folks, there are a few ladies that actually do come to work on the equipment (their little blue chart in hand, of course). And they show up wearing their khakis and blouses with their Nikes. I think "Now you went to the effort to put sneakers on, why don't you want to put comfortable clothes on". The other day I was out on a training run with my sister and the topic of "What race are you most proud of" came up. Of course we are proud of every race we finish and I should probably be the most proud of the marathon I completed, but that was not my response. Up until this point in my running career, I think I would consider Disney's Tower of Terror 10 miler to be my proudest race. I had mixed feelings about what my "proudest" race was. 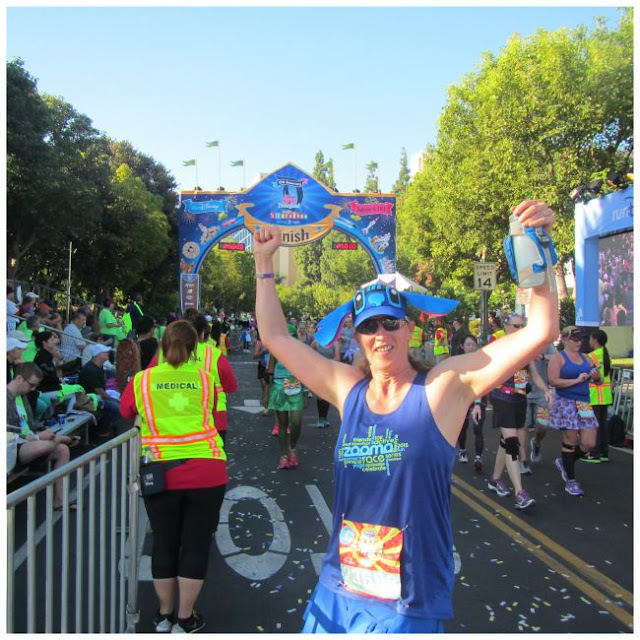 Of course I felt so proud to run the Boston marathon in 2013, but it wasn't one that I had my best time on. I purposely took things a little slower in Boston just to soak in the atmosphere. I took candy from strangers, cheered with the folks in Wellesley, and high fived the children. It was awesome. 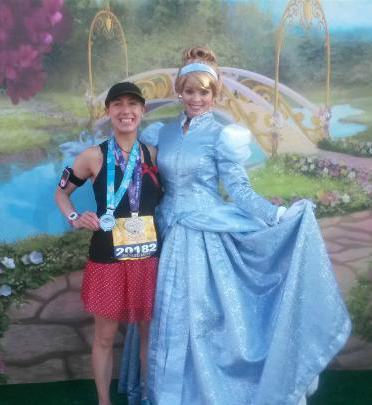 I was definitely glad to be there, but when I think about being excitedly proud of a finish, I think of the Disney Princess Half Marathon this past year. Of course we are proud of each race we finish regardless of time but these are the ones we were most excited about! What is it that makes you proud of a certain race? 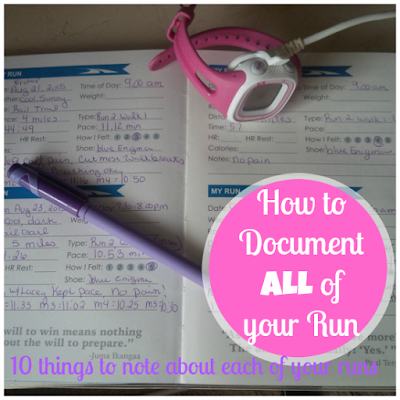 Earlier this year ( back in January) I wrote about a running journal. I bragged about how great this journal was and how I couldn't wait to start documenting my runs. The Journal was from Gone For A Run. We even gave one of them away during our runner meet-up at WDW. Well it turns out that after the wdw marathon 2015 I hadn't done any training runs so therefore, I hadn't even used that journal! I started my "official" training for next year's marathon in August ( I know I started a month too late, but I wanted to wait until I was confident that my legs/knees were strong enough). Anyway, when I started running again is when I decided to use the journal. 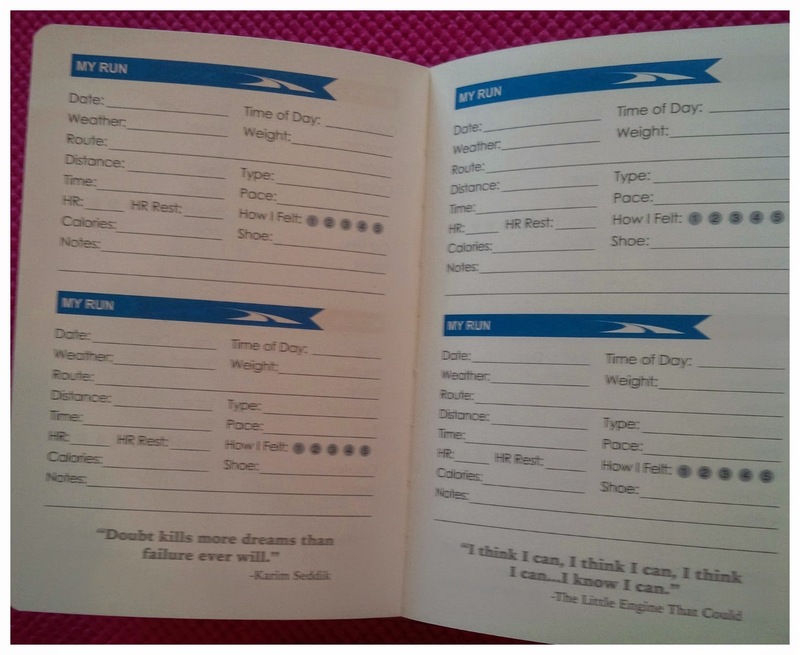 The first thing I did was fill out the goals page in the front of the book. 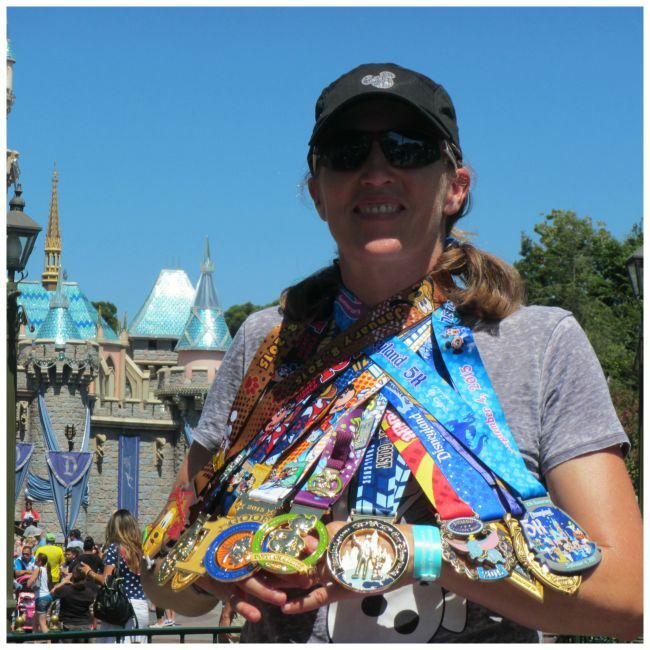 I wrote all my goals for the WDW Marathon. Yes, I did an A, B, and C goal ( I just didn't call it that at the time). Next, I turned to the back of the book and wrote down all the races that I've completed and filled out my finish time for the ones that I could remember. Then it was time to start filling out the data for my runs. I use my Garmin on my runs so I just easily transfer all the stats from my watch to the journal. These are the things I am able to track in the journal. There are a few items I don't consistently track. a 1 to 5 scale to choose how I felt about the run. I Have to say I absolutely LOVE this journal. I figured documenting each thing about my run would help me take pause when an injury starts lurking or if I am consistently having bad runs I can look back and see what all the commonalities might be. 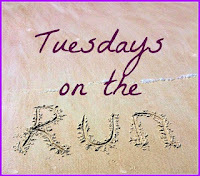 We are linking up with TOTR where the theme is about "tracking devices". Happy Friday Folks. Is it feeling like fall where you are? It's doesn't feel like fall here yet, but since we missed last week's Friday 5 where the theme was "Fall Races", we thought we would share some Fall Races today. 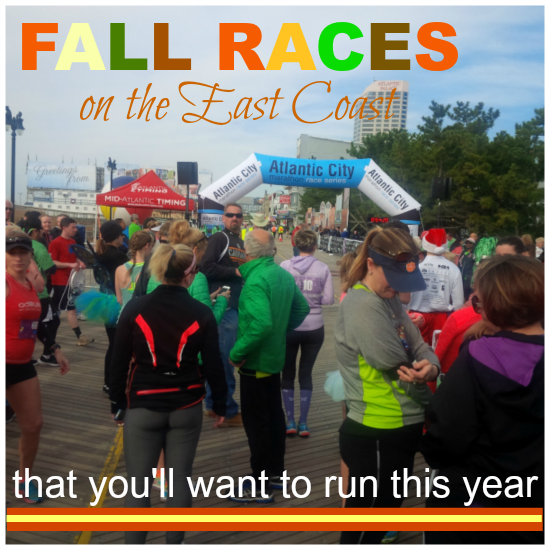 There are SO many races during the Fall that look like loads of fun, but we decided to just pick a few that are located on the East Coast. hopefully one of them will be with in driving distance to you. If you are looking for a good Oktoberfest this fall, this one is for you! This 5K run/walk is just one of the activities that will be held at the time. It's held in Bethlehem, PA at the Arts Quest Center on the Steel Stacks Campus. This is the same location the Runner's World Running Festival is held. Early VIP access and free admission to the Oktoberfest. To Register click HERE. To save $5 off your registration you can use code MATIMING. This race is for competitive runners and families and will be held in conjunction with a family fun event which includes tailgating and inflatables for the kids. 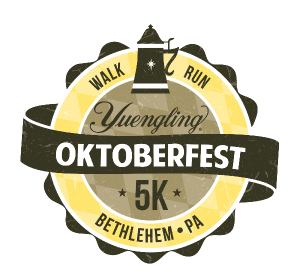 Swag includes a T-shirt and a medal for each runner and winners will get tickets to a Flyers game. The race will be held at the Wells Fargo Center in Philly. You can get more info HERE. 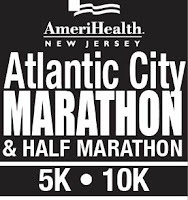 I am a huge fan of the Atlantic City races. I have done the April Fools series in the Spring for the last several year but have never done the Fall series of races. 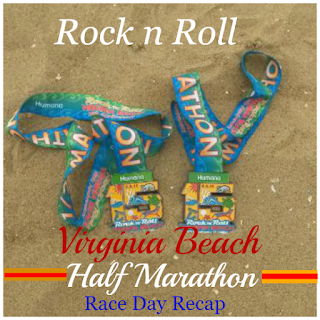 Depending on which distance you run, you will be running some or all of the race on the boardwalk which I love. This is a great time of year to run at the beach! 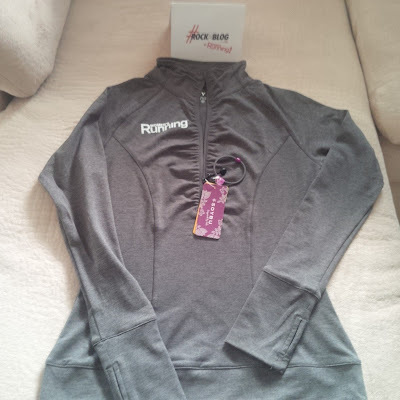 I'm loving the swag this year for the fall races and I would love to do one of them if I can find a pet friendly hotel! Yes, I must take Baylee to the beach with me if I go. 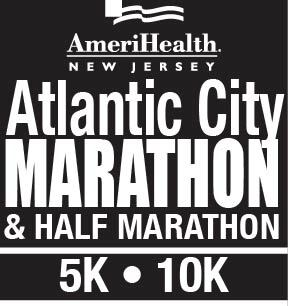 You can learn more or register for an AC race HERE. There are several races that run through Hershey Park throughout the year and I am determined to do one of them in my future! 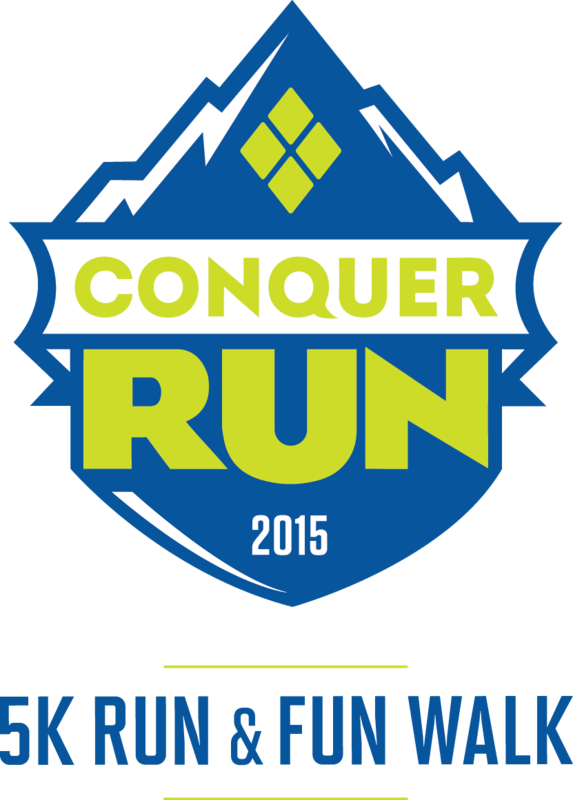 The Conquer run supports The Penn State Hershey's Children Hospital to help fight childhood cancer. This a 5K adventure through Hershey Park where you will help conquer childhood cancer by collecting each of the four diamonds – courage, strength, honesty, and wisdom – along the course! 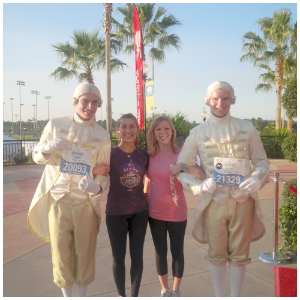 Running through chocolate world for a good cause, what could be better? 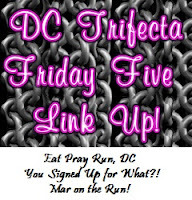 Register or more info HERE. These are two local races that we are planning on participating in. The first one is a run through the vineyard. 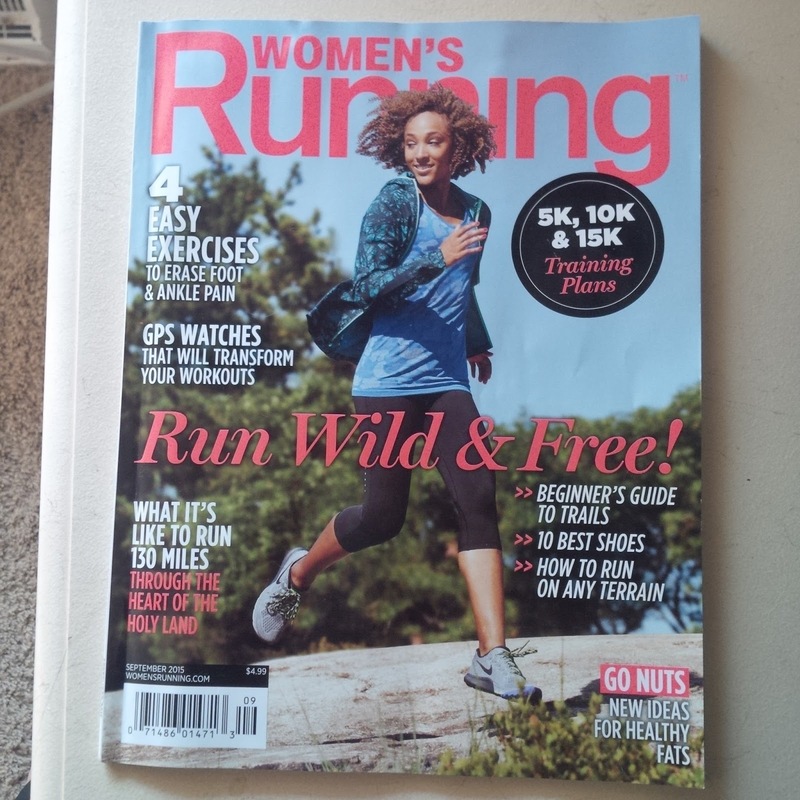 I've never done one of these before but have read about many runners who have. The description of this race makes it seem like it is very hilly course. Of course there will be some sweet treats at the end! The Lewisburg Lights 5k is a night race and we get glow sticks to wear or hold. That one should be fun too! Do you live near us? Want to run? 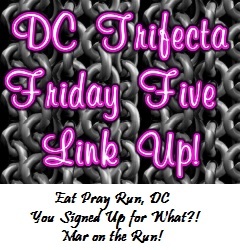 Thank you to the Friday 5 gals for hosting this link up. We arrived at Virginia Beach ready for a fun weekend. First up was picking up our packets and VIP passes at the Expo. Since it was Jay's first half it was his first time at an Expo so he enjoyed looking around at all the different booths. He was wondering why everything was so expensive. I just reminded him that is how it is at every Expo. He still ended up buying a shirt and of course a sticker to put on his truck. After the Expo we met up with some friends for lunch and enjoyed the Steve Miller Band on the beach that evening. The next day we went for brunch then it was back to the house for a relaxing evening and grilled out for dinner. Race morning arrived too early. Neither one of us had a good night sleep. After slowly getting around it was time to head out. Luckily since we had VIP Parking we were able to park right in front of the Convention Center. They offered plenty of snacks and coffee inside. There were even foam rollers and mats you could use prior to the race. The best part was being able to use the restroom and not the port-o- pottie, and there was hardly a line. Soon enough it was time to get to our corrals. I asked him one last time if he wanted me to run with him. I really didn't mind since it was his first one. But he insisted on me to just run my own pace. I told him I'd meet him at the finish line and then we went our separate ways. have the feeling after a race, like what could have we done differently. We are our own biggest critic and we just have to appreciate what we can do, not what we should've done. After completing the race, I found a really good spot at the finish line and waited for Jay. 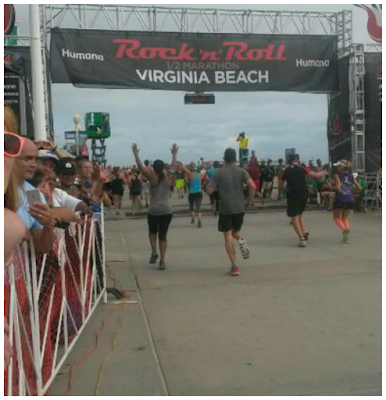 I was so excited watching him cross the finish line of his first half marathon. Now it was time to celebrate his accomplishment. We met up with some friends on the beach then it was time to enjoy our brunch and mimosas at Rock Fish. I wanted to hear all about his race while we were eating. He said he ran a lot further than he thought he as going to before taking his walk breaks. He didn't want to waste any time waiting in line for a port- o-pottie so he jumped in the woods and ended up hitting a brier bush and cut up his legs. But that didn't stop him, he continued on his way and finished strong! Later that day we went to a friend's house and enjoyed a relaxing afternoon in the pool and the hot tub. After playing a couple rounds of corn hole it was time to get read for the headliner Sheryl Crow. We thought we had the VIP for the concert since we received Race Day VIP so we didn't eat dinner because we thought it was included. When we arrived, they said that Race Day VIP and Concert VIP was different. We thought that was odd because the last few times that my sister and I were invited to be VIP, we got to do the dinner before the concert and have preferred viewing. Regardless, it wasn't a big deal and the concert was fun and Sheryl Crow put on a great show. Here is what the 15th anniversary race shirt looked like! I think it's pretty cool! Have you ever felt really good about something and then something happens and it just burst your bubble? 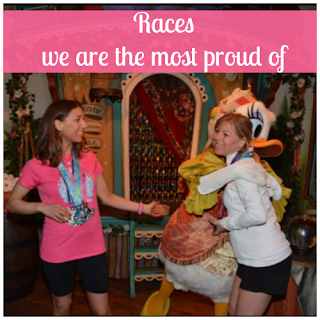 Ever since I signed up for the WDW Marathon for the second time, I had a goal to just beat last year's time. It shouldn't be hard, seeing as I ran the entire race injured last year. But, I finished the race and that's all that matters. I have to admit that I did have fun during the marathon and I DID say that I was "One and Done", but I felt like I owed it to myself to give it another try and hopefully run it at the best of my ability. So yes, my only reason in running it again is to better my time. I know it should be all about fun, but at this point I just want to see what I am capable of. I know from experience that anything can happen on race day, so it may be foolish of me to even set any goals. But there is where the problem lays. After more time than I care to admit, I've been calculating, and looking at past race paces, and looking at my current training run pace to develop a plan. 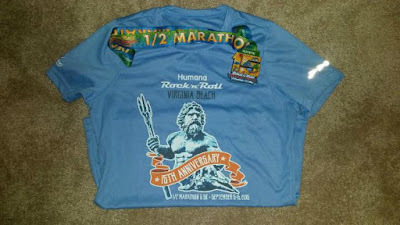 I not only wanted to finish the marathon in a better time than I did last year, but I actually have a goal time in mind. According to my plan and the average pace per mile I would have to run, it seemed doable. I would definitely be cutting it close and might not make my time if I had to make a restroom break or stop at a med tent, or any other possibility that an unpredictable race day could throw at me. I am four months out from race day and already my plan was making me nervous and I was putting undue pressure on myself. 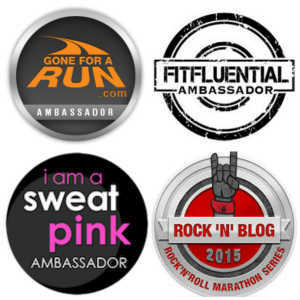 Have you ever WAY exceeded a running goal that you made for yourself? How accurate have you found those pace calculators to be? 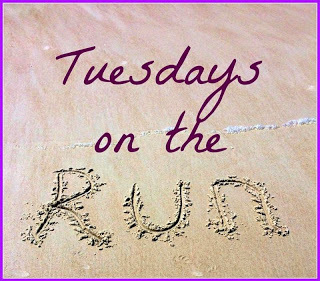 We are linking up with the lovely ladies from TOTR.